Easy-breezy Tibet travel guide for First-timers! To let you know everything that it is needed to know about how to travel Tibet! Tibet Travel Expert presents Ultimate Tibet Travel Guide for First Timers today! One could find many says about Tibet travel on the internet. For first-timers to Tibet it is especially confusing. Because some of these information were false and some of them were outdated. And it is difficult for first-timers to know which is which. As a local Lhasa-based travel agency who has specialized in arranging Tibet tours for foreign travelers since 1999, Tibet Ctrip Travel Service Team here provide you the up-to-date 100% accurate Tibet Travel Guide for First-timers to Tibet. Yes, you can! Of Ngari (western Tibet), Indian passport-holder must travel through a different channel reserved especially for Indian pilgrims. There is no age nor group size restrictions for foreign travelers to travel Tibet. It means even there is only one of you, you can still travel Tibet. To travel Tibet, besides Chinese Visa, foreign travelers also need additional documents called Tibet Permits to enter and travel Tibet. Only travel agency can apply Tibet Permits on behalf of travelers after confirmation of tour booking. This means that the authorities do not accept private applications from individuals. Also, independent travel is not possible, especially outside Lhasa city. In order for a Lhasa-based local travel agency, such as Tibet Ctrip Travel Service Team to apply Tibet Permits for you, you must confirm your tour itinerary and exact duration in Tibet. Alien’s Travel Permit (PSB): For more in-depth tour in Tibet to travel to areas like Mt Everest, Tsetang, etc, you will need a second permit. Usually your guide will handle this after your arrival. Your guide will take your original passport and Tibet Travel Permit (TTB) to the governmental office. It is a rather straight-forward procedure and takes no more than half an hour. Military Permit: You will need an additionally 3rd permit if you plan to travel more in-depth of Tibet to restricted areas as Ngari (western Tibet, including Mt Kailash, Lake Manasarovar, Guge Kingdom, etc), Rawok in eastern Tibet, etc. If you are to fly to Tibet, you need to present the original Tibet Permits in order to board the direct flight to Lhasa. Usually travel agents will mail it to your hotel in your entry city (the city before Tibet). If you are to take train to Lhasa, most cities don’t need the original Tibet Permits, photocopies of it shall do. You are suggest to print out 3 sets of the Tibet Permits as sometimes railways at both side may want to collect a photocopy set from you. Railways don’t recognize the electrical version of Tibet Permits in your mobile phone, iPad or laptop. Please print it out in papers. There are exceptions, for cities of Xian and Lanzhou, sometimes you will also need the original Tibet Permits even if you are taking a train to Tibet. No, sorry! Foreign travellers cannot travel Tibet as an independent backpacker. To travel Tibet is highly regulated and it is actually illegal for foreign travellers to use public transportation outside of Lhasa city. The road outside Lhasa is highly regulated with military guard stations every few hours away. You will stop at every single one to have your Tibet Permits examined. Traveling Tibet is expensive. A private tour of you and yours alone with guide & vehicle at your service exclusively is suggested when there are four or more travellers. The tour price will vary depending on your travel route, travel month, and hotel rate, etc. If there are only 1-3 of you, you are suggested to join a group tour instead. While a group tour certainly has its flaws, eg. Not flexible with itinerary, cannot choose your own hotels, etc. it does save you considerably. Tibet group tours’ prices are also affected by season. An 8 days Tibet group tour including Everest Base Camp is generally about USD 1000 or so. Most people believed that trains are the best solution to travel to Tibet. They assume one will be acclimating altitude during the process of the train ride. But actually this is not true. Inside the train to Tibet is pumped with artificial air to avoid altitude sickness instead of allowing you to get used to the higher and higher altitude gradually. Or some were under the impression that train is cheaper than flight. While this applies to most trains and flights of China, but not necessarily with Tibet. The sleeper train tickets to Lhasa are not too many and always in high demand. Sometimes even us, a Lhasa-based travel agency has to purchase train tickets from black market and their service charge is always high. In the end, especially during high season months of July and August, a sleeper train tickets to Lhasa may be as much as or more expensive than a flight to Lhasa. There are many cities has train to Lhasa, eg. Xining, Chengdu, Chongqing, Beijing, Shanghai, Guangzhou. etc, If you really want to experience the train to/from Tibet, we suggest you to choose Xining, of which has more trains to/from Lhasa daily, thus easier and cheaper to purchase. If it’s altitude you are worried about, the better solution is to have an extra rest day in Lhasa before start any sightseeing. Foreign travelers are not allowed to travel by public transport outside Lhasa city in Tibet. A proper travel-licensed vehicle is necessary to travel outside Lhasa city. There are many check points outside Lhasa city, where officers will check your Tibet Permits and your driver’s travel vehicle license. Our government runs the travel vehicles in Tibet. The rate is high making it the most expensive factor of your Tibet tour. If there is only 1 or 2 of you travelling on a budget, we suggest you first to consider our Tibet group tours to share the expense with other travelers. However, foreign travellers can explore Lhasa city by yourself as long as you don’t enter any attractions and remain inside Lhasa city. To enter attractions in Tibet, you need to have a guide and be on a tour. You cannot go for an excursion outside Lhasa city with a taxi which is not a travel-licensed vehicle). Tibet is available to travel all year round except during late February to early April. Because usually during this one month or so, Tibet is closed to foreign travellers. The best time to travel Tibet is from April to October, the warmer parts of the year in spring and summer when most areas of Tibet are accessible. Since November, most places of Tibet will start to snow, and the temperatures can get quite extreme at high altitude places, such as Lake Namtso, Mt Everest, etc. making them inaccessible. For travellers don’t mind the cold, winter of central Tibet has its charm too – less tourists & lower price! Accommodation in Tibet is not so high standarded. Except few 5 star international hotels in Lhasa city. At times we as travel agent also worried a named 3 star or 4 star here will give you the wrong impressions. Just keep in mind not to compare hotels in Tibet with the same rate hotels in big cities, especially outside Lhasa city. Sometimes some hotels may not even be rated with star signs out front. Except major cities in Tibet such as Lhasa, Shigatse, Tsetang, and Nyingtri, other places may only have 3 star, guesthouse, and dorm beds as best available. For example, in Gyantse the best available is local 3 star hotel; in Mt Everest area, there is only dorm bed available either at the monastery guesthouse of Rongbuk Monastery or at the nomad tent of Everest Base Camp; at the shore of Lake Namtso, there is only guesthouse with dorm bed or twin rooms available. We are shame to admit but it is true that in some remote parts of Tibet, the public restrooms are awful. You are suggest to bring sanitary wipes and hand sanitizer, and prepare you own rolls of toilet papers. At places such as Mt Everest, public bathrooms are literally just a hole in the ground. We suggest you to bring something that can cover your nose and mouth. There are many different kinds of restaurants available in Lhasa city. Such as Tibetan cuisine, Chinese cuisine, Western cuisine, Muslim cuisine, Indian cuisine and Japanese cuisine, etc. However, the choices thinner to Tibetan and Chinese cuisines mainly once you leave Lhasa city travel into minor cities and towns and villages of Tibet. During trekking days, the more comfortable way would be to hire a professional cook. To come along and prepare meals for you during the trek, but often it is expensive to do so. Or you can prepare some simple instant noodles and dry jerky. etc. to make do. Tibetan Plateau has an average elevation of above 3000 meters, the weather here is very different from in low-altitude areas. General speaking, Tibet is colder and the daily temperature changes quite dramatically. General speaking the weather has two periods in Tibet. From April to October is the warmer part of the year averagely from 12 ℃-23 ℃; from November to next March is the colder part of the year averagely from -12℃to -10℃. We used to play a game here of how to spot a tourist. Tibetans are used to the dramatic temperature changes within a day. And they wear the same outfit for the whole day. But tourists are busy with taking off and putting on clothes in different times of a day. And always feel you have choose the wrong outfit for the day. 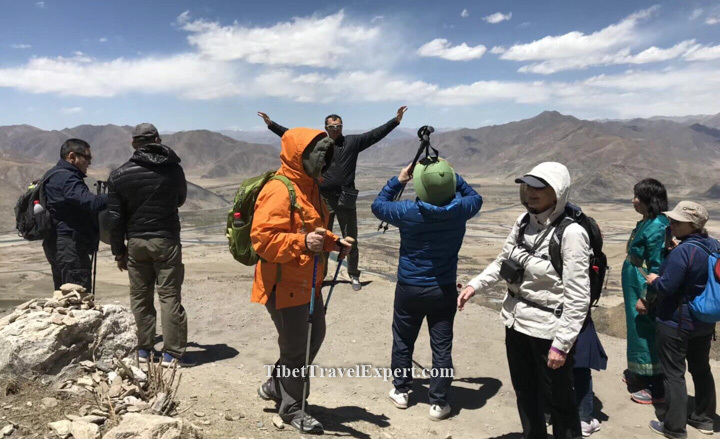 Even you are to travel Tibet during the summer of August, if your itinerary includes places like Mt Everest, Lake Namtso, etc, down jacket is a must! At high altitude places, it is still cold in summer especially during the night. Most hotels, cafes and restaurants have free wifi in Tibet. Some hotels only offer free wifi in its lobby, and some even in your rooms. However, websites such as Google, Facebook, Twitter, etc. are not accessible. You can download and install a few VPNs before you enter China and see which works here later. As in the rest of China, the legal currency in Tibet is Renminbi (RMB). Also called as China Yuan (CNY). we suggest you to change enough RMB prior you enter Tibet. Because the exchange rate in Tibet is often bad. Plus you don’t want to waste your travel time in Tibet to go to banks. Bank of China is the only place in Tibet to change foreign currency and travellers cheques. Top-end hotels in Lhasa have exchange services but only for guests. Visa card charges very high service fee of about 4%. We suggest travellers to bring cash to avoid these extra service fees. *Down jacket even in mid-summer of August, if you are heading to high altitude areas. For example, Mt Everest, Lake Namtso, Western Tibet, etc.